This is the third ice cream recipe in the series celebrating the birthdays of Mom, Grandma, Uncle, my Friend the kitchens’ Taste Tester, and my Friend the Entertainer, not to mention those of my Grand-Nephew and the Oldest of the Boys Upstairs. Just like its chocolate predecessor, today’s recipe uses the same cream base as was found in Mom’s pistachio nut ice cream recipe. Simple to make, I like its creamy texture and saw no reason to look elsewhere when developing this recipe. So, although today’s recipe was not in the recipe book she gave me, I still consider it to be her recipe and I think you’ll find that it’s pretty good. When you look over today’s recipe, you’ll note that I strain the chopped cherries, press out as much of the liquid as possible, and then soak them in half & half. That’s an attempt to replace as much of the watery syrup with the thicker half & half, in the hope that the fruit pieces will not form ice shards when frozen. You see, probably my least favorite “features” of home-made ice cream are the ice shards that can result from using fruit in a recipe. I believe the water in the fruit is the culprit and if I can eliminate the water, the problem is solved. My method may not be 100% effective but there are far fewer shards when the fruit is handled this way. If you are aware of a better way, by all means let me know. And, again, although the recipe calls for a raw egg, I always use eggs with pasteurized shells to eliminate any risk of contamination. Coarsely chop cherries, place in sieve, and use a spoon to press as much liquid out of the cherries as possible. Save liquid for later use. Soak cherries in half & half for at least an hour before proceeding. Once again strain the cherries and place the strained half & half into the blender along with the egg. “Stir” for a few seconds. Moisten the cherries with a tbsp or so of cream and refrigerate until later use. Add the reserved cherry juice, sugar, whipping cream, vanilla extract, and Kirsch, if using, to the blender and “Stir” until fully blended. Pour both the cream mixture and the chopped cherries in cream into the ice cream maker and process according to manufacturer’s instructions. When completed, remove the ice cream from the canister to be either served or transferred to a sealable container to be frozen to your liking. 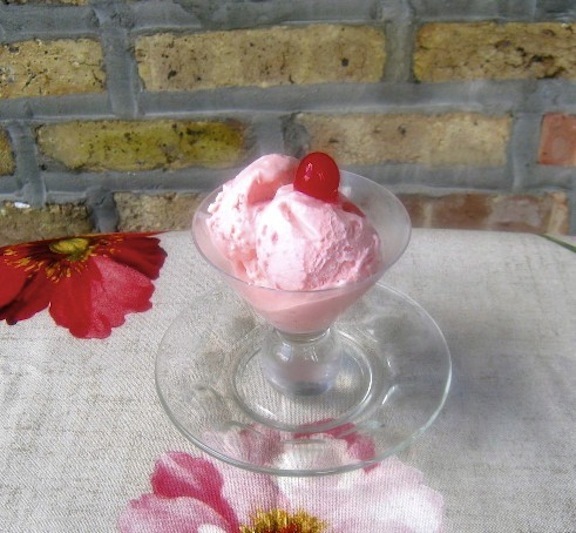 Although there are many ice creams recipes made with cherries, I chose to make one with Maraschino cherries because it’s about as far removed from tart cherries as possible. Besides, as pink as it is, it’s sure to be a big hit among some members of the Barbie Set. This being the last of August’s Fridays, one would think that it would mean an end to the ice cream recipes. Well, it’s not a “birthday 3 and a half weeks” but it is a “birthday month.” So, with this month ending on Wednesday the 31st, I’ve little choice but to offer one last recipe for an ice cream confection. See you next Wednesday. This entry was posted in Family Recipes, Sweets (Dolci), Vegetarian and tagged Dolci, Food, Fruit, Ice Cream, Italian, Recipes by ChgoJohn. Bookmark the permalink. I really like your soaking trick. Another great recipe! Thanks, soaking the cherry chunks works really well here. I’m still working on a more successful method for peaches & strawberries. There has to be a way to do it. This reminds me of Tortoni….do you recall that, with the cherries and served in little paper cups? I almost did a post on that, actually like a bisciuit tortoni with crushed biscotti. I’m definitely in the Barbie Set and would love a cup of this pretty pink ice cream!! Happy birthday month to everyone!! Here I was thinking I was the only ‘adult’ in the world who likes the flavor of Maraschino cherries. Fun recipe – looks like another winner! Oh, no, you’re not alone — or at least there’s two of us. I had all I could do to leave those cherries on the platter so that I could photograph them. It was very stressful and, on the grounds of self-recrimination, I will not divulge the fate of those cherries after the photo shoot ended. 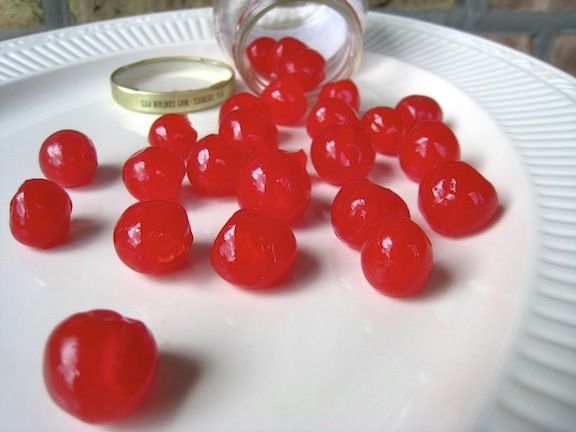 I love maraschino cherries – there´s something very “1950s Hollwood Siren-ish” about them! Never really think of using them in things other than cocktails (with umbrellas of course) and Christmas cakes – what a great idea. Oh my – ANOTHER winner of an ice cream recipe. I’m glad you like it, Mandy, and there’s still one more to come. Have a wonderful weekend! Not being much of a rum drinker, spiced or otherwise, I’ll defer to your palate and experience. To be honest, I was most concerned about freezing the cherries without ice shards developing. Everything — even liquor ?!?!? — became secondary. Clever trick! And pretty ice cream.I’ll be right over! I love the pink color! It looks very creamy and delicious! Just as a good ice cream should! We have a big birthday month in April – our daughter, my mother, my sister, Ritchey’s step-mother, my step-father, 3 brothers-in-law, one sister-in-law, a niece and a nephew! Well, I’ve shared 3 ice creams so far and there’s still another to go. I think they should help you to take care of at least a few of the birthday people. For the cake, though, you’re on your own. This looks so tasty. I just finished a run and this would hit the spot (and replace all of the calories I just burned – but hey…looks worth it!). Great article on the pasteurized eggs too. I’m going to keep those in mind – especially with the kiddos. Now that’s my kinda exercise regimen! Exercise and re-hydrate with ice cream. The pasteurized eggs are great. I never worry about using raw eggs now or who’s being served. This has been a lot of fun. 3 ice cream recipes in as many weeks — and there’s still another 1 to come. Everyone mentioned in the posts, as well as a few others, received “gifts” of ice cream — anything to get it out of my freezer. I think I’ll wait until 2012 before sharing another recipe. Give my cholesterol levels a chance to come down a bit. Too bad that you do not have an ice cream maker. Once the weather here begins to cool, I’ll put mine away until next year. It is nice having one, I must admit. Ah, another member of the club! My machine has been working overtime, trying to keep up with this blog. Thanks for the tip about the fruit, all the better that it involves vodka! I get more tips from Cook’s Illustrated and am surprised that I’ve not seen this one on their website. No matter. Because of you, I know it now and my ice cream will be the better for it. Thanks again! As a child, we loved them but now, as an adult. these are the first I’ve bought in years. Still, I wonder if they are made the same way today, being so many chemicals have been proven to be unsafe in the past 20 years. I guess we’ll never know. Your probably right John. People are much more aware of what they eat today, they’ve likely had to make them slightly healthier. Still, the colour is amazing! But your original point is well-taken, Eva. Overly processed foods are to be avoided or, at least, used only rarely. Oh!!! Maraschino cherries are were my obsession when I was a little girl. I would buy a bottle and eatall cherries!! Whenever I went to a bar, I would ask the bartender to give me extra ones in my cocktail!! You sent maraschino cherries to heaven with this recipe!! You and my sister are cut from the same cloth! She, too, loved them when she was a little girl and she loved the color pink. I’m glad you like the recipe and that it brought to mind so many good memories. Enjoy the remainder of your visit in France. Ok,OK,. Just wanted you to know I made cheese cake for Logan’s Birthday. He wanted cherries on it. (Man, after my own heart) I put soooo many on you couldn’t find the no bake cheese cake. How much icream does this recipe make? Hi, Vicki! This recipe will make about 1.5 quarts of ice cream. The same is true for the pistachio and the chocolate-chocolate chip ice cream recipes. I’ve added that info to all 3 recipes. Thanks for the heads-up. How much whipping cream do you use?